The final surviving funnel section of Isambard Kingdom Brunel's biggest steamship the SS Great Eastern is being moved to Bristol. The funnel, donated to the city by Wessex Water, will arrive on Wednesday and will sit in the museum alongside the SS Great Britain. 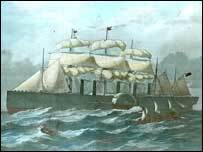 The Great Eastern was a huge ship designed to travel between England and the Far east without stopping for coal. Riddled with problems, she was severely damaged by a boiler explosion in 1858. The iron funnel section was removed from the ship and converted to act as a water strainer at a pumping station at Sutton Poyntz, near Weymouth. Until recently it formed an integral part of the system. Director of the SS Great Britain Trust, Matthew Tanner, said: "This is excellent news for the trust and for Bristol. "We are delighted that the directors of Wessex Water are keen to ensure that this important artefact is seen by as many people as possible."